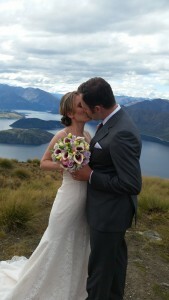 Piotr and Olia flew from Canada to get married in NZ. 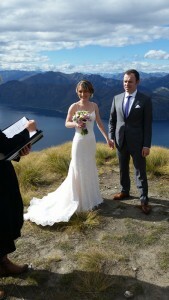 They chose the beautiful Coromandel Peak on Mt Roy, high above Wanaka to exchange their heartfelt vows to each other. Olia had previously lived in Queenstown and promised to bring Piotr back to show him (in her words) one of the most beautiful places on Earth. What moved me to tears was their story of why they invited their two very special guests. Their guests… the lovely Stefania and the equally lovely Krystyna… their mothers. And why? To say thank you for their lives. For the sacrifices they made for Piotr and Olia during their childhoods. They wanted to show them some of the love and respect that Stefania and Krystyna had shown them. They told me nothing would be able to repay the sacrifices that their mothers had made for them growing up in Poland and then moving to Canada, but they hoped that a holiday in NZ and Australia would be priceless for some wonderful and cherished memories. And judging by their reactions, I think those memories will be long talked about.